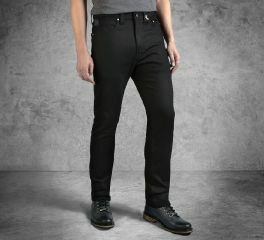 Definitely not skinny and not exactly a straight fit either, the Slim Fit Black Label Jeans fall between the two fits. 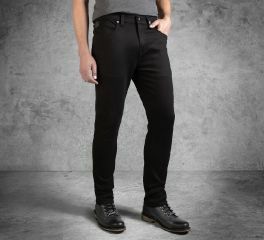 These men's jeans sit just below the natural waist, fit slim through the hip and thigh, and feature a slim leg opening for a long, lean look. A small amount of stretch is added so these jeans feel comfortable with your every move. Black denim always looks awesome with tees and hoodies. Or – stay with us – you could actually dress them up with a button front shirt.